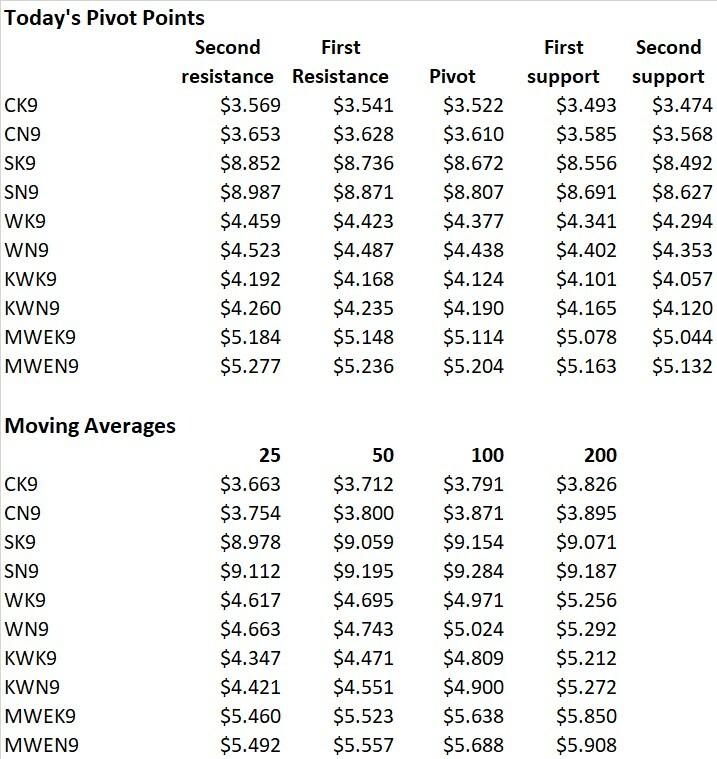 Grain futures are mixed this morning as markets try to recover from contract lows in corn and wheat and the lowest trade in soybeans since September. News the U.S. and China will meet for back-to-back weeks of trade talks helped to finally lift spirits at least a little overnight. While the grain market tumbled yesterday, some U.S. stock indexes closed at record highs, buoyed by strong corporate earnings. U.S. index futures are mixed headed into today’s open following mostly higher trade in Europe and Asia today. The brighter mood on Wall Street appears to be renewing interest in the dollar, which moved to the top of its winter and fall range today. That can be bearish for some commodities, and it’s pressuring crude oil, which is fighting to hold a close above $66 a barrel yesterday. Crude oil inventories likely will show a decline for last week when the government updates data this morning, following a drop in the number of rigs in production. However, diesel stocks may continue to tighten as ag use ramps up, sending cash Midwest wholesale benchmark prices above $2.10 a gallon. A large front is moving through the center of the country today spreading rain from central Texas to central Indiana. Several more systems are due over the next week keeping the much of the Delta and Corn Belt wet. Official 6 to 10 and 8 to 14-day forecasts out yesterday showed a zonal flow bringing warmer and drier conditions to the South. But the latest updates from the ensemble model this morning are again showing above average precipitation emerging in many areas across the country. While much of the discussion so far about weather focused on the upper Midwest, parts of the eastern Corn Belt are also soggy. Though growers are getting into fields missed by rains, others remain waterlogged. “Lots of bad wheat fields to be turned under but so wet can't even do that and more rain expected today,” reported a grower from northeast Ohio on Feedback From The Field Tuesday. “No field work being done in my area not even fertilizer being spread,” added a producer from western Wisconsin. Farm Futures wants to know what farmers are experiencing as the spring of 2019 unfolds. Click this link to tell us what’s happening in your area and we’ll publish regular updates featuring first-hand accounts from growers with an interactive map of conditions. Corn prices are mostly steady this morning after trading in a range of just a penny and a quarter overnight. Volume is brisk but most of the trade is again coming in the May-July as traders get ready for expiration of May options Friday and the start to deliveries next week. Ethanol production data out this morning for last week will show if firm margins and the big rally in crude finally had an impact on demand for the biofuel. Otherwise, demand news is quiet, with most attention focused on weather. Most locks on the Mid- and Upper Mississippi River have reopened, allow some tows to move, though rains are expected to cause more flood problems over the next week, with the full system potentially not reopening until mid-May. Barge freight rates edged higher yesterday, helping firm basis along the Illinois River, where deliveries against Chicago futures focus, taking some locations above option. The preliminary report from the CBOT showed daily futures volume up 56% yesterday to 557,627 and heavy new fund selling added another 25,479 to open interest as big speculators increased their record bearish bet on corn. Soybeans are trying to hold on to modest gains after a break below chart support Tuesday took May to its lowest level since the September bottom was made. News that two more rounds of trade talks with China are coming helped the market find at least a little footing from short covering. Otherwise, funds were again heavy sellers yesterday, helping double futures volume to 407,839 and adding 8,770 to open interest according to the preliminary report from the CBOT. Options volume more than tripled to 97,532, 61% of it puts as traders added the November $8.40 call and $8 puts. Implied volatility in at-the-money November options rose to 16.41%. Vegetable oil prices in Asia ended mixed today. May soybean oil futures in China dropped a quarter cent to 35.693 cents per pound while May palm oil futures in Malaysia recovered from heavy early selling to close unchanged at 22.80 cents. Oilseed markets internationally are also mixed. May soybean futures in China were 2.3 cents higher at $13.467, May rapeseed futures in Paris lost 3.2 cents to $9.215 and Winnipeg canola overnight was up 2 cents at 7.401 after adjustments for currencies and volumes. Wheat prices are mixed in their attempt to hold on to a fledgling turn-around after reversing higher Tuesday. Minneapolis appears to be getting the most traction on wet forecasts for planting after joining HRW in making a new contract low yesterday. Export news is again thin this morning, keeping the trade’s focus on weather around the world, which so far supports ideas of decent production in the northern hemisphere. Overseas markets tried to hold firm nonetheless. May futures for Eastern Australian Wheat settled steady at $7.085 and May futures in Paris midday trade are up a penny to $5.581 after adjustments for currencies and volumes. Volume in soft red winter wheat was 27% higher yesterday at 161,979 while open interest was up 6,041 despite light fund short covering. Options volume fell 20% to 23,961, 63% of it calls as traders liquidated May puts that expire Friday. Implied volatility in at-the-money July options increased to 22.73%. HRW volume was 57% higher at 77,335 on open interest that was up 903.